Another mass shooting and once again I head to my blog and try to explain to the “guns at any cost” crowd that the cost is getting way too high. The point is, the latest carnage—and our casualty record-holder at this writing—was carried out with a semi-automatic weapon. You do not need one of those to protect your family or to do whatever it is you do to feel better about yourself. Being a personal weapon of mass destruction, it’s no different than a bazooka or a tank. We’re not allowed to own those, but because it’s called a rifle, every N.R.A. card carrying member immediately goes to “they’re trying to take all of our weapons.” No. Just the ones that are designed to kill mass numbers of people in a short time. Remember, these days, we’re no longer allowed to identify people as crazy or, technically speaking, having a few screws loose. So, until they prove themselves completely off their rockers, they can walk into a gun store and buy a rapid-fire rifle. I’m officially refusing to accept that this is just going to happen. When given the spotlight Sunday, Florida Senator Marco Rubio said, “It was Orlando’s turn.” That’s just viewing this as a game or right of passage or inevitable. 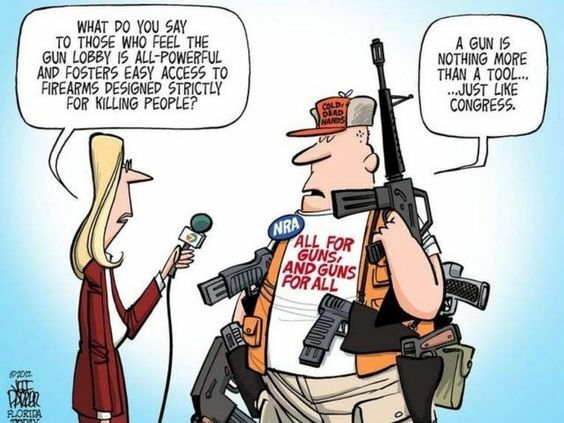 Mass murder by deranged, angry person with an assault weapon can and must be prevented. I’m not willing to have my family or friends gunned down so that you can enjoy your misconstrued constitutional right to have an arsenal of every weapon imaginable at your home. If you believe the United States government is going to come to your home and take away all your guns, then you’ve got some serious issues to deal with. Jim Jefferies does a masterful job of explaining exactly how I feel about guns in this video. Yes, there are some F-bombs, but they were never more appropriate than in this piece. It is part 1 of 2, but the second part is easy to find on YouTube once you watch this one. The late night TV hosts all said some thoughtful things in the aftermath, but TBS host Samantha Bee was the most on target. How many more times does a mass killing of innocent lives have to happen until our country does something about it?